Sarah is passionate about bettering the community in which she lives and providing mentorship and leadership to everyone she impacts, professionally and personally. Currently in her 12th year as a Junior League member, Sarah has held various roles including: Vice President of Fundraising to various fundraising chairs in other Leagues, Deck the Palms Day of Committee, Digital Chair, Secretary and many other roles throughout her tenure in the League. 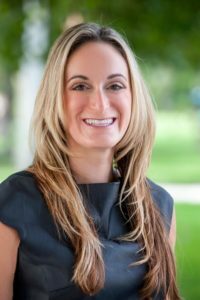 Professionally, Sarah focuses on shopping center development and specializes in operations, leasing, construction, design, and marketing of various types of centers. She and her husband also own a third-generation custom pool design company. Sarah graduated with a Bachelor of Science in Business with a focus on Marketing from the University of North Carolina at Asheville.